On June 5 and 6, some of the most talented robots from around the world gathered in Pomona, Calif., to vie for superiority over eight grueling events. The occasion was the finals of the DARPA Robotics Challenge. For the 23 teams competing, it marked the culmination of a three-year effort to design and program a robot capable of operating in disaster areas that are too dangerous for humans to enter. Massachusetts was well-represented in the field. 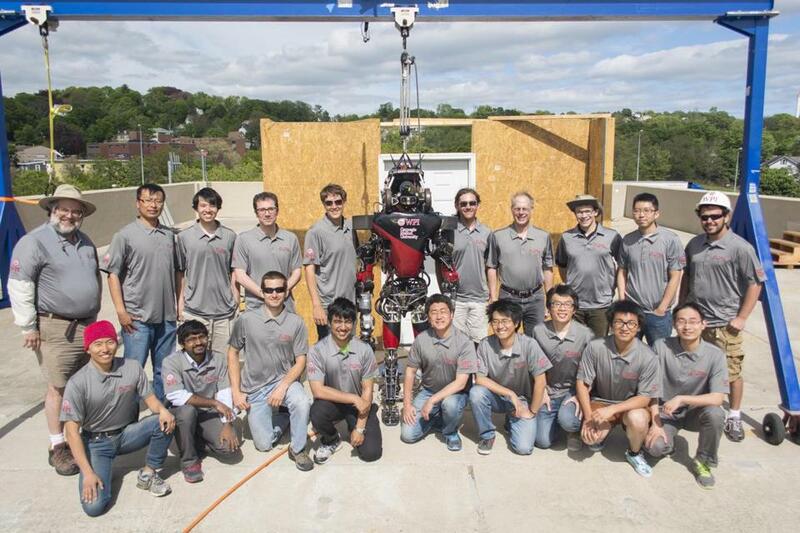 Both MIT and Worcester Polytechnic Institute sent entries, using modified versions of the 7-feet-tall, humanoid Atlas robot designed by Boston Dynamics. The tasks they had to complete included tripping circuit breakers, turning valves, climbing stairs, traversing rubble, and driving and exiting a car — all for time. These are mundane tasks in human hands, but for robots, they pose unique challenges. “The robot is fairly large and the vehicle’s seating position was pretty tight. Getting out of the car was a challenging task for many teams,” says Taskin Padir, an electrical engineer at WPI and co-leader of that team. Padir’s team, which was a collaborative effort between WPI and Carnegie Mellon University, successfully completed 7 of the 8 tasks and finished 7th overall, just behind MIT. Per the rules of the competition, they controlled their robot, WARNER, from a locked garage a few thousand feet from the obstacle field. The controllers could only see what WARNER saw, and they executed tasks using a combination of human direction and robot autonomy. With the driving, for instance, WARNER controlled the throttle, but the engineers steered by looking through WARNER’s eyes and controlling WARNER’s limbs. Padir was especially proud of his team’s performance driving and exiting the car. The one task they failed at was the drilling, a multistep maneuver that required the robot to pick up a drill, turn it on, and cut a hole in a piece of dry wall. The winning entry was a robot called DRC-Hubo, which was designed by a team from South Korea. Hubo’s most notable feature was the ability to transform from a four-wheeled vehicle to a standing, bipedal position. Bipedal mode was useful when it came to climbing stairs, but Hubo completed most tasks in the four-wheeled position, which allowed the team to plow through the debris field and provided important stability. Stability, it turned out, was key. Many robots fell during the competition and once down, they couldn’t get back up. The spills were captured in a surprisingly hilarious compilation video that’s since gone viral. It shows robots teetering like toddlers before falling over and ending up hopelessly prone on the ground. Padir expressed some disappointment that his team placed outside the top 3, though he’s excited to build on what they learned during the challenge. The biggest areas for improvement in robotics, he thinks, are the development of better “end effectors” (ie: robotic hands), improved bipedal stability, and enhanced perception algorithms. While he and others get to work on those problems, the rest of us can sit back with some degree of reassurance. Yes, robots aren’t likely to help us clear hurricane debris anytime soon, but as the missteps in the robotics challenge made clear, they’re also still quite a ways from conquering human civilization.